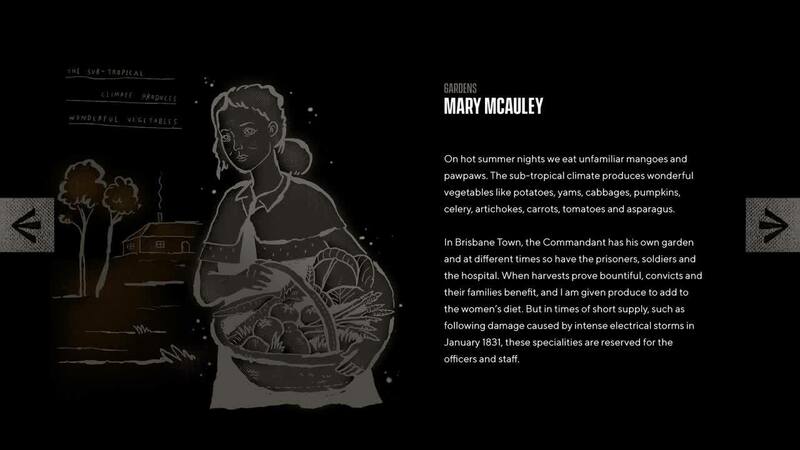 Museum of Brisbane provides visitors with unique insights into our city's history, like its new Life in Irons exhibit about those who endured Australia's most brutal penal colony. The Museum team asked us to create an interactive experience that would give people a real sense of what life in irons was like, and we were fortunate to be involved from the start. Doing so gave us a greater understanding of how the exhibit would be presented and what the Museum team wanted visitors to think and feel as they travelled back in time via rare documents and precious artefacts, complemented by the interactive experience we would create. Together with the Museum team we wondered, who were the people forced to call this notorious settlement home? What were their stories? Could we delve into history to tell of their lives? As researchers partnered with Queensland State Archives to uncover the stories of 5 men and women, from prisoners to soldiers and servants, we looked at how a simple interactive experience could tell their tales. This is when early involvement with the project proved invaluable, because we knew the exhibition had to have minimal light to protect frail papers and clothing from strong illumination. And that the hushed atmosphere created from privately contemplating the past might not be suitable for a hi-tech, disruptive experience. We believed our solution should feel the same, not be intrusive and something you engaged with when you wanted to, and easy for anyone to use without unnecessary complexity. When the researchers returned with 5 real life stories, we decided to break them down into separate chapters, small episodes in history you could hold in your hand. To bring the stories to life, we created a series of storytelling kiosks built into display modules. As visitors entered the exhibit they took 5 different story cards, each one like a barcoded bookmark that opened the pages on a bygone life by inserting the card. The story could then be read on a touch screen, with subtle animation to punctuate key moments in the tale. Each card opened a different chapter in someone's life, matched to Brisbane locations described in documents displayed nearby, so visitors could gain a sense of place, and every story would further unfold as visitors made their way around the exhibit. With only pages from history to imagine lives and personalities, we asked digital artist Joel Matheson to interpret how he saw the characters and their experiences. Joel's coarse and textured illustrative style captures the intimacy of a hand-written journal while reflecting the bleak hardship and feeling of life without hope or freedom. This stark interpretation carried over to animation sequences in the storytelling which used subtle haunting movement and changes in texture and shade to add drama. Life in Irons has been a rewarding opportunity for the Liquid team to be involved with, reminding us, as we've learnt and practiced before, that digital design doesn’t have to be hi-tech, that designing for maximum accessibility and audience engagement can far more important, and often more effective. The Life in Irons exhibition was open 18 May 2018 - 28 October 2018.